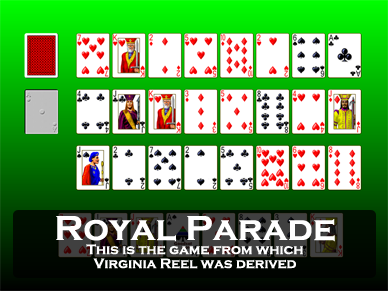 Screen shot of the game Virginia Reel from Pretty Good Solitaire. Virginia Reel was invented by Albert Morehead & Geoffrey Mott-Smith as an easier variation of the classic game Royal Parade. Virginia Reel is rather a complicated game to explain, but once you learn the rules play goes smoothly. It is a two deck game. At the start of the game, a Two, Three, and Four of different suits are set out on the left to start 3 rows of cards. Then seven more cards are dealt out horizontally face up to the right on each row, forming 3 rows of 8 cards each, with the top row starting with a Two on the left, the middle row a Three, and the lower row a Four. These three rows will be the foundation rows. Then a fourth row of 8 cards is dealt at the bottom. This row will be the reserve row and the top card of each of the 8 piles with be available for play (Pretty Good Solitaire highlights this row in a white box). The remaining cards are set aside face down as the stock. Whenever there are no more moves to be played, 8 more cards are dealt from the stock to the 8 piles in the reserve row until the stock is empty. The objective is to place the Twos in the top foundation row, the Threes in the middle row, and the Fours in the lower row. Then building is up by threes of the same suit from there. Therefore on the Twos you will build up 5, 8, and Jack, on the Threes you build 6, 9, and Queen, and on the Fours you build 7, 10, and King. Aces will be discarded to a special Ace foundation pile as they appear. Once all the cards are moved to these foundations, the game is won. The problem at the start is that only the leftmost card of each row is in the proper place - a Two in the first row, a Three in the middle row, or a Four in the bottom row, unless by chance other Twos, Threes, or Fours have been dealt in their proper rows, as sometimes happens. You must first create spaces in the foundations before you can place Twos, Threes, and Fours in their proper places. Spaces can be created by moving out Aces to the Ace foundation or by playing a card in the foundations to another foundation pile - such as playing a Five on a Two in the top row. You cannot play on a Two, Three, or Four in the wrong row (you can't play a Five on Two in the middle row, for example, because that's the row where the starting cards are Threes). If there are two cards in the wrong rows (such as a Two in the Threes row and Three in the Twos row), you are allowed to swap them into their proper rows. You can also play the top card of any of the piles in the reserve row to the foundations. There is a tricky catch to spaces, though. You are not allowed to deal more cards to the reserve row until all spaces in the foundations are filled. This means that you can only create a space in the foundation if you can fill that space with a Two, Three, or Four before you need to deal out another row of cards to the reserve. This rule means that you can't always make plays until a Two, Three, or Four becomes available to fill the resulting space. And that's how Virginia Reel is played. Again, the rules are complicated, but it makes for a strategic, interesting, and difficult game. The inventors claim a win rate of 25%, but I'm barely able to do 5%. There are a lot of things you can do to help your chances. Always discard Aces from the reserve row, but don't be in any hurry to get rid of them from the foundation rows. You may need that space later. Try at all costs to keep from burying Twos, Threes, and Fours deep in the reserve piles where you can't get them. Although you can interchange Twos, Threes, and Fours in the foundations, it's not always a good idea because it doesn't create a space to play another card into. 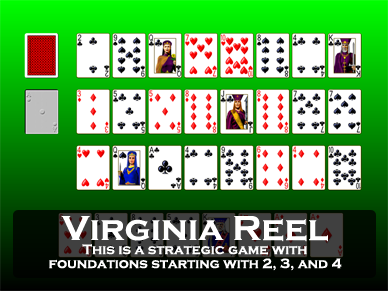 Virginia Reel is one of the 850 games in Pretty Good Solitaire and one of the 101 games in Goodsol Solitaire 101.